Alarm clocks had been set for 6 a.m, but I woke up at 5, ready to go. The trip was over, except for the journey home. We had done most of the packing the night before, and had agreed to have breakfast at a truck stop on the way to the airport. I can’t recall stopping, other than to take on fuel for the last time, close to the airport. We were now all rather subdued – the trip was over. We arrived at the airport without incident and having dropped Anne, Alain and all the luggage off at the Departures drop off point, I took the car to the agreed spot in the car park. It is amazing how emotionally involved you can get with a lump of metal. Each time, I quietly say thank you to the car – it is amazing how much we put these cars through and how little trouble they usually present us with. This Toyota had been particularly well behaved – thank you. I found the others in the departure area and, after checking in our luggage, we went to the souvenir shop to reduce the rather large amount of Chilean pesos we had left over. I know that better and cheaper souvenirs can be bought en route – as I had found in Toconao, but these then have to be dragged around for the remainder of the trip, when fragile cups and clocks can easily get broken. The rep from the car rental firm managed to find us – a sign that we must have stood out in the crowd – and the formalities of returning the car were soon completed without problem. Unlike 2003, the flights took off on time. As usual, I could not resist the temptation of taking yet more pictures of the flight over the Andes. On previous trips, a feeling of depression crept in as soon as the km readings on Ruta 5 started to drop below 1000, north of Chañaral. The last week however had been so full of unexpected and new experiences that the feeling did not hit me until S318, yesterday. We had made it to the Bahia cabañas at Guanaqueros, where we had also stayed on my birthday in 2001. We had breakfast at one of the many truck stops along Ruta 5. From here it was a relatively short drive to Fray Jorge, as I had promised Alain to show him some ‘big’ Eriosyce and in the hope of collecting some more seed. And so, at 9:15 a.m. we presented ourselves at the entrance gate (closed) to the Parque Nacional Fray Jorge (S319), where the sign proclaimed a 9:00 opening time. The warden arrived at 10:15, just as we set off to our next stop (S320), on the track back to Ruta 5, where on previous occasions, if we had brought a small vacuum cleaner, we could have collected kilos of E. aurata seed. This time I had brought my adopted seed sucker, with a larger bore tube, but like Ian’s last year, it too got blocked by the third seed, so that it was back to tweezers to top up supplies. Being foreigners, we felt we had a good excuse to ignore the ‘Private property – no admittance’ signs that had now appeared along the track. There were more fences going up, so in Bob Dylan’s words: ‘The Times, They Are A-Changing’. There were two more stops to make before the trip was over – bar the journey home. S321 was last year’s stop in the Quillimari valley where this time Eriosyce curvispina was in full flower. Again, agricultural development was progressing at pace. Some of the neatly newly planted out vineyards on the hillside across the valley reminded me of the war graves of allied soldiers around Arnhem in the Netherlands and filled me with similar sadness in the knowledge that it would not be long before the cacti that we had pictured would be ploughed under. S322 was a celebration – the coast at Pichidangui that had become an unplanned, almost accidental, last stop in 2001, only to provide the continuity for trips as it became the first and last stop of subsequent trips. In a way it offered the promise of being the first stop on the next Chile adventure, provisionally planned as ‘Angie’s Birthday Tour 2007’. We had the rest of the afternoon to feast our eyes and cameras on the numerous plants in flower before returning to our cabañas and doing the final packing. Where had all the extra luggage come from!?!?!? S322: Eriosyce chilensis (albidiflora) can be ugly plants, with beautiful flowers. The name Domeyko has intrigued me each time that I see it on maps during trip planning or reviews and as I see the signs to the village as we speed past in on our way north or south. This intrigue is probably caused by the name Copiapoa domeykoensis on a label of one of the Copiapoa coquimbana in my collection – not a very dynamic or attractive plant, but a Copiapoa none the less. In 2001, at the start of our trip, we had actually stopped in the village to buy some bananas. We were still naive enough to believe that we’d find plants of C. domeykoensis near the name plate where the track entered the village. Since then I have learned how widespread the name Domeyko is. In addition to this village (population 936 according to recent statistics) there is also the Cordillera de Domeyko that could be described as the Chilean foothills to the Andes in Northern Chile. A close look at the map near Domeyko also draws attention to another Chilean (or rather South American?) feature, that of the same geographical names cropping up time and time again, so confusing to those relying on type locality information to assist in determining the true identity of a plant. When driving north past Domeyko, it is usually the lure of other, better known and arguably more dynamic Copiapoa locations laying in wait, that prevents a longer stay in the area. But on the return leg south, there is often a couple of hours spare time and this otherwise boring stretch of Ruta 5 sets the mind to thinking of ways to fill this time. In 2003, it was a photo stop to take pictures of peppers or tomatoes lying in the sun to dry, followed by a brief exploratory trip to the west, turning off Ruta 5 at Trapiche (S202), along the Quebrada do los Choros where we found some wonderful C. coquimbana (S203). This time I had looked at the Ritter’s original description for C. domeykoensis, or rather his C. pseudocoquimbana var. domeykoensis and had learned that this grows 18 km south west of Domeyko. Ritter preferred his epithet pseudocoquimbana to the rather brief and much older description (1886) for Echinocactus coquimbana and so opened up another chapter of Copiapoa intrigue (a.k.a. ‘another can of worms’) that is worthy of a full chapter in a book on Copiapoa (Rudolf, please note!) rather than a few lines here. Ritter quotes FR 1091 as the type and Englera 16 – the bible for Ritter Freaks – indicates that the plant was collected from 4 locations, 18 km south west-, 16.5 km west-, 20 km west- and 18 km west of Domeyko respectively, all sold and presented as FR 1091! And so we turned west at Domeyko, and followed Ritter’s trail, driving along the Quebrada Chañaral (giving rise to Ritter’s C. pseudocoquimbana var chaniarensis) and Quebrada Carrizalillo (depending on which map you use) to Carrizalillo, a village situated on the plain that lies at the mouth of this Quebrada) and stopped at km 16.5 (S314) and again at km 29.2 (S315) and took pictures of the Copiapoa growing alongside the track, the most likely ancestors of C. pseudocoquimbana var. domeykoensis or perhaps the very plants on which his description was based. As the valley widens out into a broad plain, we took numerous pictures of the Desierto Florido and of the round-up of donkeys by local farmers on horseback – the nearest that I’ll get to witnessing the sort of North American wild west scenes that first attracted me to the plants that appeared as unpaid extras in the cast of ‘Cowboy films’. 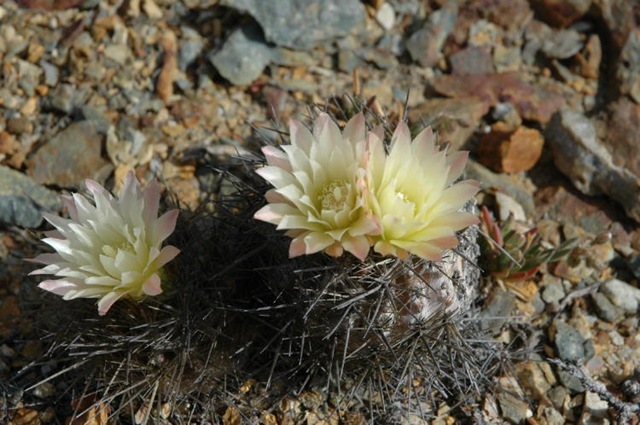 We made two more cactus stops (S316 and S317) on the track from Carrizalillo to Caleta Chañaral, where we found the most attractive individual Eulychnia that I’d ever seen, as well as lots more C. pseudocoquimbana – probably accounting for all the Ritter varieties at his splitting peak. At S317 there were several large clumps displaying enough body and spine variability to account for all of them! Some even reminded me of C. echinoides, but that’s another story. Time passes too quickly when you are enjoying yourself and I realised that the track from Carrizalillo to Trapiche was easier to find on the map than in real life, so that returning the way we had come would be a longer drive, but a better, safer option. The last stop of the day was along Ruta 5, just past Los Hornos (S318) – the stop that I use to gauge seasonal / climatic trends, comparing scenery from the start and end of each trip. My conclusion was that flowering had peaked. No doubt Graham Charles, doing this trips a few weeks behind us, will tell me different. No doubt we’ll have to get together and compare pictures over a few bottles of wine. It’s a hard life! We stayed the night in Guanaqueros. Earlier this year, the British Cactus & Succulent Society’s Journal contained a review by Paul Hoxey of Copiapoa humilis and its many wide spread locations, where small differences with plants at the Paposo type locality had created a series of taxa, some of which Paul recognised as subspecies. (BCSJ 22(1):29-42). 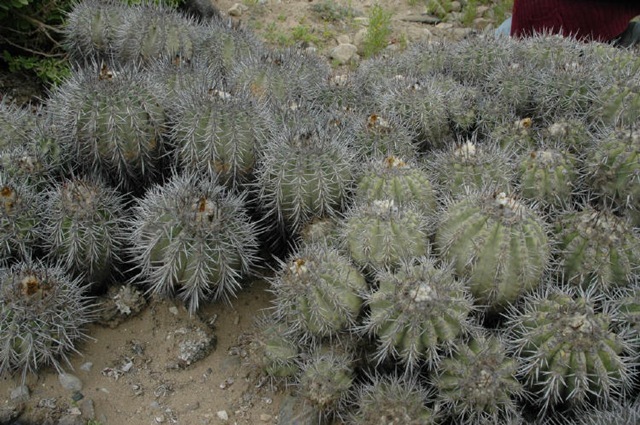 He had added a new one, Copiapoa humilis ssp australis – the most southern form, from a hill top south of Huasco. I was highly sceptical. Plants from the Humilis group are generally regarded as not coming down this far south and the Huasco river is regarded to be the northern border of the Coquimbana group, with C. fiedleriana the common form around Huasco. Rudolf Schulz, Ingrid Schaub and Ricardo Keim had carried out some searches in the area earlier in 2004, without positive success, although, as a ‘negative success’, they had narrowed down the number of hill tops that still required exploration, to a manageable number. We decided to start at our usual stop (2001/S024 and 2003/S118), this time S308. Here too, we were amazed at the amount of greenery and wild flowers, especially as previous visits had been to soot covered scenery and plants. It was easy to spot the first Eriosyce napina as they were pumped up and either in flower or with recent flower remains (but no ripe fruits yet). As we started to take their pictures it soon became clear that there were so many napina that it was difficult not to stand on a few while taking pictures of the others. Copiapoa fiedleriana was also looking a lot happier than on previous occasions when the plants had looked so dry that it had been difficult to identify the genus, let alone the species to which these plants belong. The patch that had been in contact with Euphorbia latex on previous days started to itch again – a sure sign that there were more of these plants to be found, confirmed by E. thinophila weeping with latex next to the napina that we had just photographed. 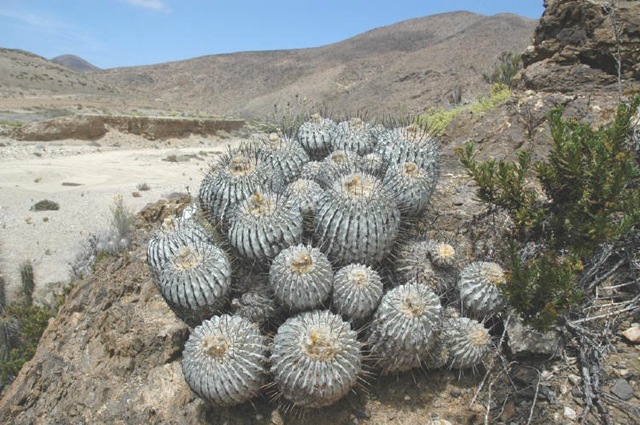 But the real reason that I had come back to Huasco was to look for Copiapoa humilis ssp australis, We decided that if this plant exists, it had to be reasonably near by and that we could discount hill tops already checked out by Rudolf, Ingrid and Ricardo during the summer. Looking at the maps on my laptop left one candidate, for which I took an approximate GPS reading. We drove up a track away from the coast and with the aid of Bart’s and my GPS readings identified the hill that for most of the morning had been shrouded in clouds. At this spot (S309) the ground was carpeted with a white to light purplish lily that has tentatively IDed as Zephyra elegans. A wonderful excuse for some marvellous pictures, while the cloud over the hill slowly lifted. The clouds actually made sense – C. humilis likes to grow in high altitude fog zones. We found a suitable place to park (S310), so that our ascend would be as short as possible. Bart and I were the only cactophiles mad enough to have a go. I was amazed at the speed with which Bart disappeared up the hill. I remembered previous climbs and the need to pace oneself, plus my scepticism acted as a powerful break. If C. humilis did grow on this hill, there would be no need to go all the way to the top, but at Bart’s speed, there was little chance of his spotting any growing at lower levels, or of my keeping up with him. I followed at a more leisurely pace. There seemed to be a smallish plateau at around 300 m. altitude. I decided to take some scenic pictures, to at least prove to Paul H. that we’d been on ‘his’ hill and to make a thorough search (hands & knees) of this area, but only found more typical C. fiedleriana. I felt sure that Paul H. and his companions (Clark Brunt, Jonas Luethy and Simon Mentha) could tell these from humilis. I carried on, up the hill, more sceptical than ever. 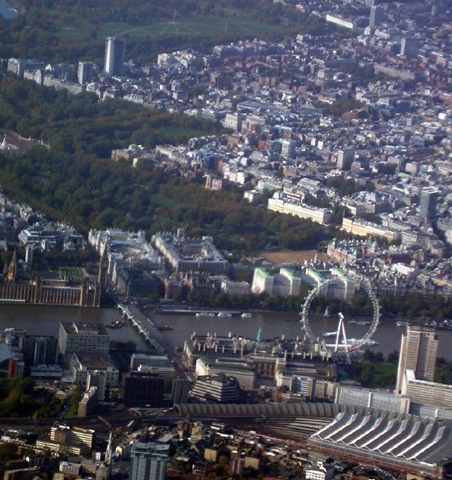 Another ‘wrong hill’? Or was Paul’s diagnosis incorrect? I was shaken out of my thoughts, as a snake (only the second that I had encountered on the three trips) dashed past me. It seemed as shocked as I was. I was comforted by the belief (true or not) that there are no poisonous snakes native to the north of Chile, but there is nothing like a face to face confrontation to start questioning your believes. And poisonous or not, I’d rather avoid a bite. The last time I had encountered a very similar looking snake had been on level ground, near the entrance to Fray Jorge N.P. The one today had found me clambering up a fairly steep hillside with lots of lose rocks and the shock of our encounter had made me slip some metres back down the hillside, so I was actually ‘face to face’ with my reptile friend, although some distance apart. We looked at each other, as though to size each other up. I managed to take its picture, but Snakey had quickly moved out of sight by the time I had found a better, more stable position to take further pictures. The encounter had left me quite exhausted and, added to my scepticism, was enough to dissuade me from continuing to the top. There was no need, as the sound of small rocks rolling down the hill announced Bart’s descend, long before I caught sight of him. Leo, Rudolf: I think you have another candidate to compete with for the official title of ‘Copiapoathon Mountain Goat’! Bart amazed me by confirming that he had indeed found Copiapoa humilis growing at the top of the hill. He had taken several pictures, but we’ll have to wait for the slides to be developed and duplicated / scanned before knowing exactly what Bart found, but some heads that had become dislodged by his climbing activities had come down the hill as evidence and were duly digitalised so that Alain can include them in his daily images. This population, by far the most southern of any previously known humilis locality, appears to indicate that once upon a time humilis was a widely distributed taxon, but that, as the climate became drier, is currently only to be found at a number of quite widely distributed remnant populations. So how many of these are there left to be discovered? Surely enough to warrant further visits to Chile. And the prospect of speculating when and where during dark winter evenings back in Europe with a few bottles of Pisco Sour and Cabernet Sauvignon is another thing to look forward to. Satisfied to place another ‘tick’ on my initial wish list for the trip, we had lunch and drove to Freirina for some sightseeing and another 2003 stop (S117), at Maitencillo, where alongside C. coquimbana and / or C. fiedleriana (these plants still looked very dry) we found Eriosyce napina ssp lembckei (S311). The rate at which Maitencillo was expanding and the agricultural development that seems to accompany this are worthy of praise, while I fear for the future of the cacti at this locality. So how far did it extend? We drove some 5 km along the track, sign posted for Ojo de Agua and found many more plants in much healthier condition (S312), and confirmed these observations again some 5 km further on (S313), before returning to Huasco and our farewell meal with Bart & Marijke. Time for our return to Europe was approaching. It was becoming a familiar rather than surprising sight, waking up in Copiapó’s Hotel Miramonte, with the Ruta 5 bridge over the Rio Copiapó shrouded in fog, just as in 2003. However, by the time that we had finished breakfast, it had already started to lift and continued to lift as we drove up the Rio Copiapó valley to Paipote. My aim was to familiarise myself with another of the northern Chilean river valleys, having made similar inland sojourns up the Rio Limari / Rio Grande valley (2003), Rio Elqui (2001 and 2003) and Rio Huasco (2001). Like the other valleys, the water flow is now controlled by a dam (at Embalsa Lautaro) that stores water in a man-made lake. We did not go that far, having planned to turn west at Puente Potrero Seco. Like the other valleys, the stored water is used to good effect in irrigating the valley and surrounding lower hill sides with extensive vineyards all around. Ironic that the activities that threatens the survival of cacti in the wild – change of land use; here agriculture – had clearly lead to increased prosperity of the local human population and had provided us with numerous pleasant evenings back in Europe as we enjoyed our bottles of Chilean wine at our Copiapoathon reunions. In addition, this valley has extensive mining activity, with mines determining the quality of the roads and where in the valley they lead. This tends to be in the green centre of the valley, rather than close to the hill sides with the opportunity to explore some of the tracks leading further up hill. We followed a sign west to Ruta 5, believing that the confusing intersection we had reached was at Potrero Seco. It was not, and so we followed an excellent road that runs from Nantoco over the hills to Ruta 5. New vineyards were in the process of being established, in various stages of progress from freshly ploughed fields to newly planted areas and others where the first crop seemed to be harvested. We stopped soon after we reached the top of the hills (S301) at 1,041 m. altitude according to my GPS. We found the omni-present Cumulopuntia sphaerica, Miqueliopuntia miqueli and statuesque, lichen covered, Eulychnia and looked to the west on the cloud cover that seemed to lie on top of the Pan Americana as it ran between Copiapó and Vallenar. It seems that the valley between these hills and the coastal hills further west is an excellent fog catcher, so that it is no coincidence that the area is most frequently featured in articles and photographs about el Desierto Florido – The Flowering Desert. Soon we were on Ruta 5, but fortunately the fog was just a low cloud base over our heads that soon burned off as the sun 28 degrees South packs quite a punch in October. There was another surprise, as instead of having to play ‘spot-the-turn-off’ for the track to Carrizal Bajo, it was properly sign posted and the track had turned into an excellent tarmac road. Having read many of Ritter’s travelogues, it is hard to imagine that he’d get his car stuck in sand here on a regular basis. Again – road building does destroy habitats, but it also opens up so much more country to be explored. Let’s hope that this in turn does not lead to ultimate total habitat destruction. We stopped at km 48.5 from Ruta 5 (S302) and found Copiapoa echinata and Eulychnia, some with the buds bare, apart from small soft scales, characteristic of E. acida and some with almost white woolly buds, associated with E. breviflora / iquiquensis. Some of the Eulychnia were in flower. S303 was last year’s S198 – irresistible as the first Copiapoa dealbata appeared alongside the track. These are among the most impressive Copiapoa, forming huge clumps of white-waxed heads. The variability in spination, stem shape and colour is amazing. We also found an interesting red lily, Leontochir ovallei (Garra de léon – the Lion’s claw) among the desert flowers that increased in number as we came closer to the coast. Apparently this is among the most sought after of Chilean lilies, referred to as ‘the holy grail’ on a US bulb hobby list. We showed Alain Carrizal Bajo – again with signs of growth and development all around, with a sign indicating that an Airport (Aerodromo Gran Cañon) is planned for the outskirts of town, at this time, covered in wild flowers (S304).The bright yellow flowers of Cruckshanksia pumila, a small shrub, prompted another stop, too close to the last one to take a GPS reading – it was difficult to progress as every ten metres some new plants seemed to jump into the scenery. S305, near Caleta Sarco del Norte, was another 2003 stop, but this time, with non-cactus flora dominating the scenery, it was difficult to spot the large clumps of C. dealbata that stood out so prominently last year. S306 was prompted by a rocky outcrop with C. echinoides, on a sandy plain. Alain and my built-in Euphorbia-spotting allergy concurred – in the sand we found the cousin of Euphorbia copiapina – the straight leaved E. thinophila, again in great numbers and by no means a rarity – when it is visible. How many times does an event need to be repeated to become ‘a tradition’? If three is enough, then we had reached the traditional spot for the Copiapoathon Group Photo – this time S307 (S200 in 2003 and S030 in 2001) – the sloping side of a water run-off covered in large mounds of C. dealbata, with small C. echinata also dotted around. Last year, we took a look on the other side of the slope and found many small Eriosyce (Thelocephala) sp., probably a form of E. napina. They were quite easy to find this time, as most had very recent flower remains (no ripe seed) and were plumped up from recent moisture. Some were still in flower. All good things come to an end (for now) and so it was time to move on to Huasco. What a day! We had to pinch ourselves during that evening’s slide show in Hostal San Fernando, to check that we were not just dreaming of the huge range of plants and scenery that we had seen all in the space of 12 hours. How could we improve on this tomorrow? At 8:30 a.m. we’d had breakfast, bought provisions for a lunch time snack and were topping up the cars with fuel at the Copec station, some 20 km west of Copiapó, on Ruta 5. We carried on driving towards Caldera, while I offered to drop Alain any where he wanted, to dig in the ‘sand dunes near Copiapó’, the only details we had for finding a plant on his wish list: Euphorbia copiapina. Alain reminded me of the Adidas poster we had seen near the petrol station: ‘Impossible is Nothing’. Ricardo Keim had provided us with some suggestions for C. megarhiza and C. echinoides locations on a track off the Pan Americana, sign-posted for Barranquillas. This would take us through the flat and almost featureless ‘flood plain’ that is the mouth of the Rio Copiapó. The term ‘flood plain’ seems somewhat inappropriate for a river that usually contains no more than a trickle of water, but I guess that during it’s long history, things have not always been this dry. As we drove along this area on Ruta 5 the previous day, we had noticed another patch of ‘purple haze’, but nothing could have prepared us for the sight that unfolded before us. This is why Hendrix must have written ‘Purple Haze’ and must have inspired Prince to write ‘Purple Rain’ – mile after mile of (primarily) purple Calandrinia longiscapa. 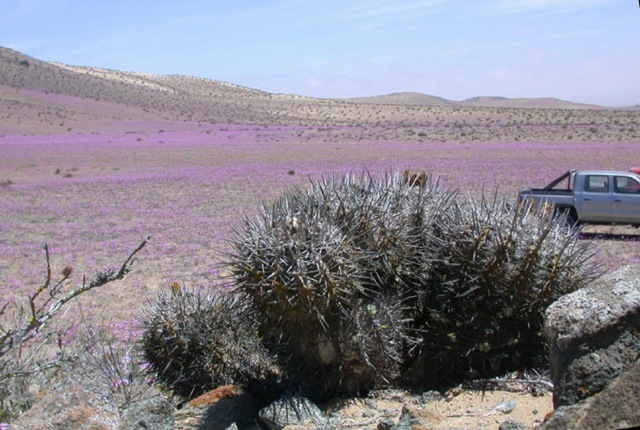 Each flower is no more than a couple of centimetres in diameter, they are relatively widely spaced on the desert floor and in addition to purple, they also come in yellow, white and red to name but a few colours. But it is the unbelievable number of these small plants that create the overwhelming spectacle (S294). As I lay flat on the desert to get a good picture just over the top of the flowers, my hand started itching and stinging – a typical allergy reaction. The reason soon became obvious, as the plant I had rested my hand on was bleeding white latex. I know that I am very sensitive to Euphorbia latex, but never thought to turn it to my advantage as a detector for Euphorbia copiapina. I shouted to Alain and Bart to share my exciting discovery, but already found them in the traditional posture for looking at small plants in the desert: head down and rear end pointing at the sky. They too had found the plants. And so we had succeeded in one of the goals to find this rare and much sought after Euphorbia. It soon became clear that the only reason that it is regarded as rare, is that it is invisible unless the right conditions for the desert to spring into flower present themselves. When visible, they are as numerous as any weed, with plants at least every meter (c. 3 ft) apart. Plants were in flower and in (unfortunately still unripe) fruit. Words really won’t do this spectacle justice, so Alain’s picture site will have to fill in. It was not easy to drive on, as each turn seemed to present a different angle on the flowers, bringing out new hues and colours, so the stop number actually refers to frequent stops along several km. of track. You also have to imagine Alain chasing some of the millions of attractive beetles through the desert with his digital camera, taking short bursts of video, and to hear the bird song that had replaced the usual deadly hush. Those who know me will recognise how unusual it is for me to spend so many words on non-cactus matters. So things could only get better when we approached the hills mentioned by Ricardo, also covered in flowers, but now joined by an Eriosyce sp. (help Ricardo, which one?) on one of the hills (S295) and C. megarhiza (var. borealis) on the neighbouring hill (S296) that Bart decided to explore instead. All good things come to an end, and so the huge areas of the flowering desert became more like the usual scenery, although still with a lot more signs of recent rain and resulting flowering then I had seen before. S297 was a ‘leg stretch’ to see if there were any cacti at all – we only found some recently flowered Trichocereus – and S298 was prompted by the sight of some large clumps of Copiapoa echinoides that were full of fruit. This also revealed some much smaller and spinier C. echinata, but without signs of buds and flowering. Similarly, lots of C. echinoides further on at S299. And so we approached the km 22 marker on the track from Totoral to Ruta 5 (S300). Another Dutch friend, Evert Smienk, had been here in 2002 and reported seeing plants that he thought were ‘different’ and perhaps worthy of describing. He had been very kind in giving me a number of seedlings raised from seed collected from these plants. I showed these seedlings to Benjy Oliver, for me the best person to put a reliable ID to young Copiapoa seedlings. He did not hesitate and declared ‘definitely echinoides‘. I promised Evert to try to see these particular plants in habitat but at first it seemed that I would have to file a disappointing report, as there was no sign of cacti at the km 22 marker, but plenty of tracks of diggers etc. However, a little further up the road, Anne had noticed some shrubs and a nice Eulychnia. As we walked over we found clumps of C. echinoides, including the very individual shaped plant of which Evert had sent me a picture and which had been the mother to his seedlings. I’d have to explain at this stage that I regard C. echinoides as a broad species that includes such names as C. dura and C. cuprea.